Please note that we will no longer shred papers which contain carbon - for example newspapers and self-carbonating books/papers. Unfortunately, the carbon damages the machinery extensively. Any carboned paperwork will be kept separate and sent, sealed, for pulping. Please do contact us if you have any questions or concerns. R6.00 per kg, plus collection charges where applicable (R50 minimum shredding charge applies). Greencycle staff will come to your home or office; place everything to be shredded into our purple bags, which will be cable-tied closed and labelled. The bags will then be brought back to our warehouse, where we have a secure room, dedicated to the storage and shredding of confidential documents, accessed by authorised personnel only. You will receive an invoice with the weight received and charges within 24 hours, and once the shredding is complete we will send you a confirmation letter for your records. Customers may also bring their papers to our warehouse for shredding. Ensure that you give clear instruction that the documents are for shredding and that all papers are placed in our purple bags and weighed. For bulk shredding quotes (more than 1 ton), please contact us. 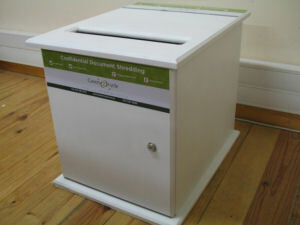 Two Greencycle staff members will come to your premises with our shredding machine. They will require sufficient area in which to work and an electrical plug outlet within 5 metres. Our staff will sort the paper as necessary, removing documents from files, separating cardboard, paper and plastic, etc; staples do not need to be removed. Shredded paper will be packaged into bags and removed by Greencycle. 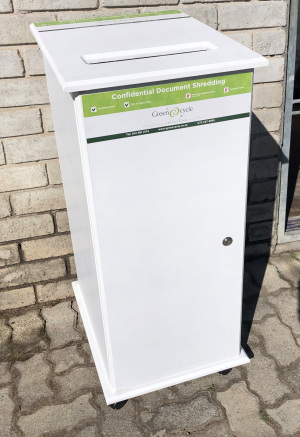 A secure and attractive box can be placed at your premises into which you, and your colleagues, can post any documents that need shredding. The boxes are locked and keys are held by Greencycle, ensuring box contents are inaccessible once posted. Greencycle staff will come to your office; transfer the contents into a bag, which will be cable-tied and labelled. The bag will then be brought back to the dedicated shredding room at Greencycle, and the contents shredded. As usual, confirmation will be sent once shredding is complete. Note: please do not crumple or tear up papers that are to be shredded.